From today I am delighted to announce that you can now easily import all your Sage Pay transactions directly into Sage One. Sage One and Sage Pay have integrated in a number of ways for some time now. Sage One users have been able to add ‘Pay Now’ buttons to their invoices, as well as take credit card payments over the telephone. However as Sage Pay is Europe’s leading payment provider and Sage One is in a unique position in providing online accounts for the UK, Ireland, Spain, France, Germany and Portugal, it was inevitable that our two flagship cloud services would work together more and more seamlessly. Once the two systems are connected, you will receive daily feeds of all the payments you processed via Sage Pay into Sage One. These transactions can be easily categorised and be imported into Sage One. The more you use this service, the more the system learns too, and in no time you’ll be importing transactions without any typing whatsoever. As well as being a great time saver, having real-time access to your Sage Pay transactions will allow you to keep your finances more up-to-date giving you a much more accurate view of your business. You’ll be able to monitor cash flow like never before! 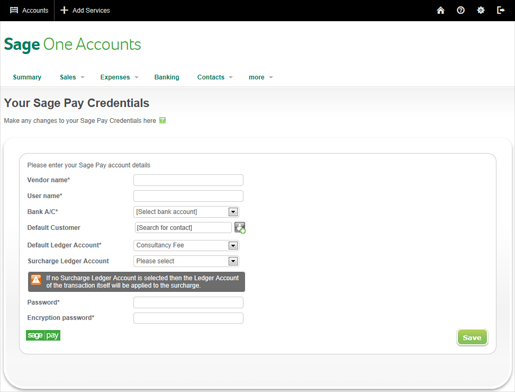 Settings > Accounts Settings > Sage Pay Settings in the new service. 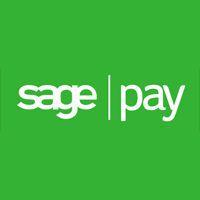 If you’re an existing Sage One customer and want to start selling online using Sage Pay, please give the team a call on 0845 111 0797 or request a call back by using this form.